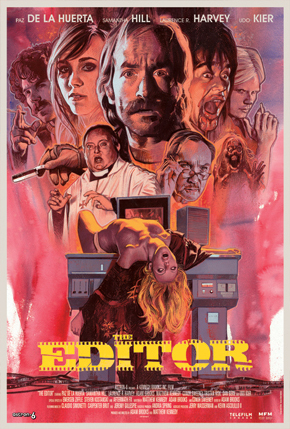 A very specific and inventive giallo homage by the talented filmmakers behind FATHER’S DAY known as Astron 6, who have marvellously aped the look and sound of vintage Italian thrillers on a tiny budget. The bravura attention to detail extends to Graham Humphreys-designed posters and even familiar fonts for the titles. Melancholic editor Adam Brooks was crippled by a tragic accident that left him with four wooden fingers; he becomes a prime suspect when the cast and crew of the giallo on which he is working are brutally killed (axe, chainsaw, cut-throat razor etc) at regular intervals. Affectionately capturing the mannered performances, fashions, red herrings, un-PC attitudes, bizarre flashbacks and strangely alienating post-production dubbing that are all characteristic of the giallo, the film’s tone successfully veers from subtle homage to broad lampoon (notably a case of “hysterical blindness”). There are overt tributes to (among others) THE BLACK BELLY OF THE TARANTULA and even Fulci’s THE HOUSE BY THE CEMETERY, alongside inventive use of notable 70’s tropes including split screen, car chases through cardboard boxes and a marvellously retro soundtrack. Directors Brooks (channelling Franco Nero) and Kennedy are excellent in their acting roles, and welcome cameos include a characteristically creepy Udo Kier and Laurence R Harvey as a priest.